– Bounty Rush is a 4 versus 4 “capture the flag” multiplayer game. You and three other random players will fight 4 players on a battlefield to take control of treasures and collect berries. The team with the most berries at the end wins the match. There’s another win condition, but it’s harder to secure. Your team should capture all five treasures on a map and hold them for a certain period of time to win. – There are five random treasure locations on a map. You and your team mates will have to quickly move to treasures highlighted by circles, called “treasure areas”. When you are inside the circle, and there’s no enemy on the same treasure area, tap the flag icon on the lower-right corner of the screen to try and capture the treasure. – When a treasure is captured, your team will earn a whole lot of berries. The number of berries earned by each team is displayed on the top of the screen. A captured treasure automatically keeps earning bonus berries for your team unless it’s captured by the enemy team. Keep taking treasures in your control to increase your berry count. Remember: the team with more berries at the end of the battle wins. – When an enemy captures a treasure, the circle around it changes to the color of his team. If he belongs to the Oceans the circle changes to Blue. If your opponent is in team Suns, the circle changes to orange. – You will have to fight your enemies and push them away from the treasure area before recapturing the treasure. Forcing them out of the circle is a temporary solution. You will have KO your enemy. A knocked-out enemy will respawn from his starting position. Remember: You cannot capture a treasure when there’s an enemy on the same circle. – The in-game map on the right side of the screen shows treasure locations. It also displays how many treasures are being captured by your team and your opponent by coloring the treasure icons blue or orange as per the team colors. – You will have to select two characters to play a league match. Tap Party > Edit Party and then drag two characters from the list on the left-hand side to add to your party. 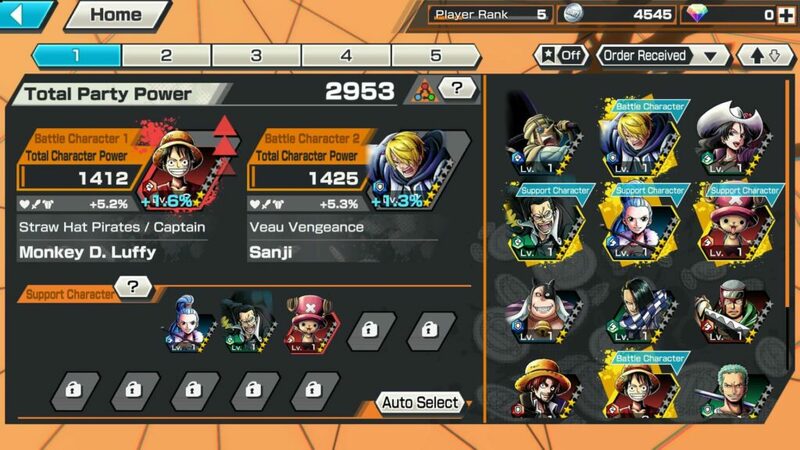 Just before the battle begins, you can choose any one character out of the two as your starter hero. When you are KO’d, you will again be able to select a character from the two. Make sure you select and quickly tap “Brawl” to respawn. Just ignore that timer on the brawl button. When a league battle ends, you will be awarded the same number of treasure chests as treasures that your team has captured and secured at the end of a battle. So, if you and your team secure 4 treasures, you will receive 4 treasure chests as rewards. Check our gameplay video in this guide to know more. It will take some time to capture a treasure if you are the only one inside the circle, i.e. treasure area. However, if there are more team members in the circle, you will capture it instantly. While capturing, you may have noticed a gauge just above the flag on the treasure area. This gauge fills up a bit when there are more team members inside the circle. The more the number of players (of the same team) in the circle, the faster you will capture it. Even if you run across the treasure area while a team member is capturing, he will still be able to capture it instantly. One Piece Bounty Rush is all about teamwork. When your team members are trying to capture a treasure, you should try to stop enemies from entering the circle. If you have chosen the defender class, then your sole focus should be to make sure that enemies don’t enter the treasure area stop your team member(s) from capturing the flag. They can’t capture until they are forced out of the circle or KO’d. Keep your enemies busy when your team mates are capturing a treasure. While fighting enemies, pay attention to their element. An enemy’s element is color-coded and is displayed just above his/her head, on the left side of their health bar. You can view your party character’s element beside his portrait on the party edit screen and on his portrait on the top of the battle screen. There are three types of elements and characters have one of the three elements – Red, Green and Blue. Red is strong against Green. Blue is strong against Red. Green is strong against Blue. Depending on the opponent’s color-coded element, the damage dealt or received will change. So obviously if you are fighting a Green element character and your character’s element is Blue, you will receive more damage. If you come across a stronger elemental character and you are the only one fighting him, it would be wiser to flee instead of fighting. You will be KO’d in no time. You can join your team or focus on a treasure that hasn’t been captured yet. Always pay attention to an enemy’s elemental color before starting a fight. 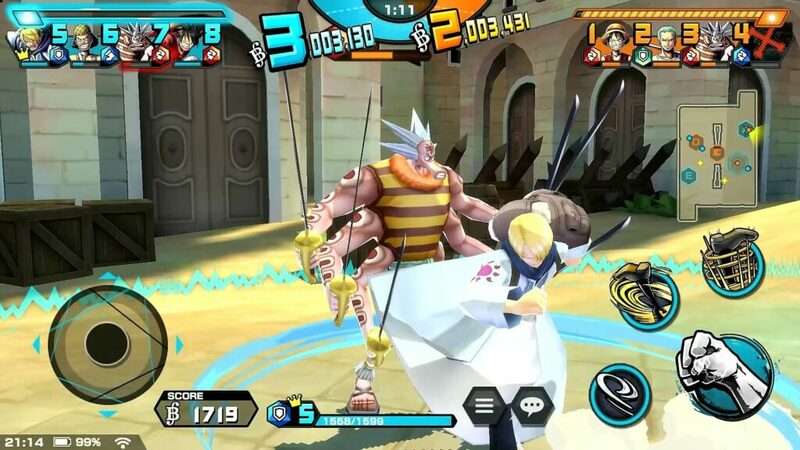 If you have selected a character that belongs to the “Attacker” class, then you should use him/her in combat. Your focus should be more on attacking enemies and KO-ing as many enemies as possible. If you have chosen a “Defender”, you should focus more on defending a treasure area and forcing enemies out of the circle as soon as your team mates begin capturing the treasure. Defenders have high DEF stats and skills so make the most of these skills to defend a treasure area. Runners are best used for capturing unprotected treasure, thanks to their high speed. If you have selected a runner, then you should quickly check the map for any treasure that hasn’t been captured yet and quickly move to that area to capture it. Since a runner has high speed, you will move to that spot quickly. A character’s class is denoted by an icon, which is displayed on the lower-left corner of his portrait in the party page. Knowing your role in a league battle will make it easier for you to defeat enemies and capture treasures. Adding support characters to your party increases the stats of your battle characters. You can’t use support characters in a league battle, but the two main battle heroes receive a nice little stat boost when you drag a character to the empty slot in the “support” section. To add support characters, go to Party > Edit Party. When you drag a character onto the support section, you will see a percentage increase in total stats of your character. If a support character’s elemental color matches with your battle character’s elemental color, the stats boost he/she will receive will be much higher than normal. For example: If you have red and green battle characters and if you add a red element support character, your red battle character will receive a higher stat boost than your green battle character in your party. As you get promoted to higher One Piece Bounty Rush leagues, you will face tougher opponents. To put forth a good fight against your enemies, you must have stronger battle characters. The best way to make them more powerful is to level them up using EXP Orbs. You will earn EXP orbs primarily from league battles, but you can also get them as login bonuses or by completing certain “Daily”, “Normal” or “Event” missions. Don’t forget to check your gift box. It contains at least 5500 EXP orbs. Leveling up a character in your party increases key stats, such as ATK, HP, DEF and CRT, you also increase your battle character’s power. This is important because a team with more power have an edge in a battle. To level up a character go to party > edit party and tap his portrait. Now tap “Level-Up”. You can move the slider or tap the “+” button if you want to reach a certain level. However, you will need several orbs if you want to jump to level 11 from level 1. Save your EXP orbs to level up the best characters in your party. 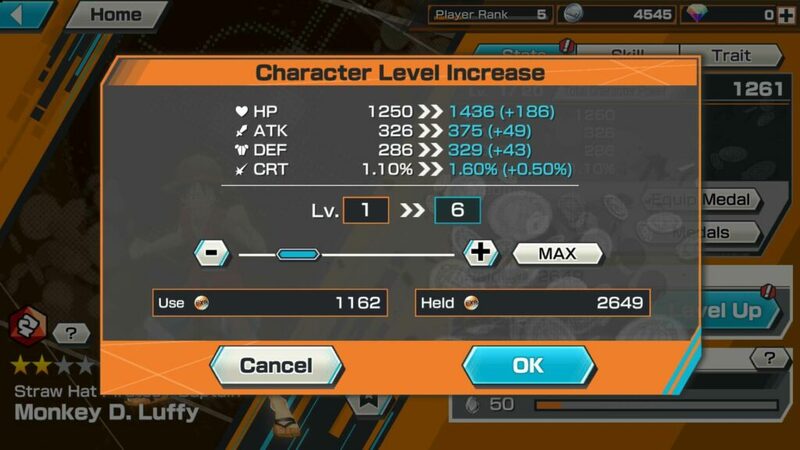 Not only you can level up your character to improve his stats, but also upgrade your character’s skills to make them more powerful. Once you go to “Edit Party”, all you have to do is tap a character’s portrait and then tap his “skills” tab to upgrade his unlocked skills. You will need two types of orbs to upgrade a character’s skill – A skill orb that matches with his class (defender, attacker etc.) and a skill orb that belongs to the same element (Blue, green and red). You will have to collect a certain number of class skill orbs and element skill orbs to upgrade his skill. For example: To upgrade Monkey D. Luffy’s skill to level 2, you will need at least 5 attacker skill orbs and 5 element orbs that matches with his elemental color. You can obtain elemental orbs as well as class orbs from league battles and “skill orb missions” under “missions”. Fragments can be used to grade up a character. You will need a certain number of duplicate fragments of the same character to raise his/her grade. A character gains an additional star when you grade up. Grading up a character unlocks new skills and increases his status. A character’s “grade” section can be found below the “level up” section on his page. You can get fragments from treasure chests, which you receive as rewards after a league battle ends. You will also get fragments from the “Head Start” login bonus and Normal missions. As login bonuses. You will get them on certain days. Check your Daily Login chart to find out when you will be receiving diamonds. You can also obtain diamonds from the 7-day special “Head Start” login event that appears daily. Get diamonds from daily and normal missions. Complete certain missions to get them. Get them as season rewards. On your home screen, tap “League Battle” and then tap “League Information” to know the quantity of rainbow diamonds as season rewards when you are promoted to a new league. Keep battling to earn league points and reach a score target to get promoted to a new league.